Amazon is revamping its Echo Dot speaker to entice parents with its new child-friendly Kids Edition. The Echo Dot Kids Edition is a regular Echo Dot with a rugged rubber band around it (Blue, Green or Red), a 1 year subscription to Amazon's FreeTime Unlimited and 2 years of worry-free warranty, meaning Amazon will replace your broken Echo Dot Kids Edition for free, no questions asked. And all of that comes at the price of $79 which is $30 more than the $49 Echo Dot 2nd Generation. The $30 may be worth it though, especially if you plan to use FreeTime Unlimited which costs $36 coupled a year normally. FreeTime Unlimited adds kids-specific features like Audible books for kids (which the Echo Dot can read to your kids), thousands of songs from Amazon Music (explicit songs filtered out) and curated skills from Disney, Nickelodeon and more. After the first year of preloaded FreeTime Unlimited users will be billed $2.99 a month. 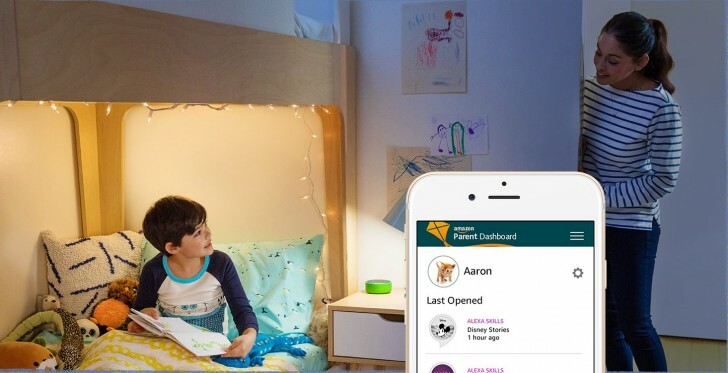 Parents can broadcast messages to the Echo Dot Kids Edition through other Echo devices throughout the home. And finally parents get a dashboard with parental controls and oversight. You can pre-order the Echo Dot Kids Edition today for $79.99 with shipments scheduled to start May 9. Still not getting how people give up privacy for a speaker that does...not much at all.